Train whistles used to provide the background noise for my home videos. But that was before I lived near an Army air base. Actually, I live between Hunter Army Airfield (15 miles to the East, by road, not air) and Fort Stewart (40 miles to the Southwest.) There’s a train around here somewhere too. I can hear the whistle when the Army sounds are quiet, which isn’t often. The sound of a jet taking off is unmistakable, but it was months of hearing the booming rumble that would literally shake our house before a neighbor nonchalantly explained that was just the artillery fire at Fort Stewart. It was unsettling at first to hear artillery fire at all times of the day and night. (Especially night.) I’d never been anywhere before where it sounded like the middle of a war. My neighbors – most have lived here all their lives, or at least a long time – are evidently oblivious to the sound now. You get used to it over time, I guess, and it’s just background noise. I think our armed forces, in general, are like that – in the background. Men and women, doing their jobs out of the eye of most of us; learning, preparing, protecting in ways we never see. That’s how I think of those sounds now that I’ve been hearing them for a year. Someone is learning to fire a really big gun in case they need to protect me. Another someone is learning to fly fighter jets or bombers (I don’t even know what, I’m very military aircraft dumb) to protect the borders of the nation I live in. I don’t want to be nonchalant about that, ever. I don’t want it to become simply background noise. These are sounds of peacetime in action. I picture these brave people I hear firing the artillery (or piloting one of those jets I hear but can’t see) getting off work after a long day and returning to their family for dinner or out with friends for a movie. I know that’s a rose-colored view; there are many still being deployed and leaving families behind for far too long to be healthy. But my sheltered, privileged, American-housewife self can absorb only so much reality at a time. And I just learned to be comforted by the sound of peacetime artillery fire. Baby steps, privileged American housewife, baby steps. There is something utterly awe-striking in watching the ginormous Army helicopters return to the Airfield or feel the subtle rumble in your gut from artillery fire. Just like seeing Air Force One fly into Wichita for service or the rare sighting of the Stealth Bomber. I am privileged to have lived near Wichita, Kansas, the “Air Capital of The World,” and now live in Savannah, Georgia, where the skies are always full of wonder. But I still miss the trains. I have this rule about children riding in my car: not in the front seat until you’re thirteen. This rule came about from a story I read in a novel about a fireman’s experience with the death of a young child, having been thrown through the dash into the engine in a car accident. I think it might have been out of a Karen Kingsbury book. (Ask me about it and I’ll tell you.) The story grabbed at my heart and didn’t let go. So I made the rule and rarely break it. When the first of my Littles turned thirteen, and earned his rite of passage to the front seat, I knew the who-was-sitting-where argument would end; the other Little choosing any seat he wanted in the back. I also anticipated the return of the arguments when the second Little turned thirteen. What I did not expect was the argument turning to who got to sit in the back! Whaaa……??? 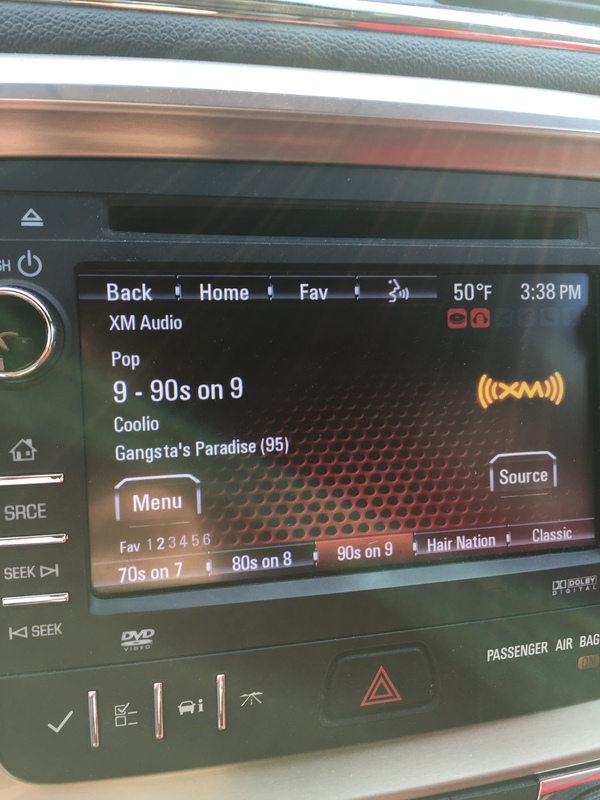 SiriusXM makes for a great torture tool when it comes to what you make your kids listen to while riding in the front seat with you. Specifically, 70s on 7, 80s on 8, and 90s on 9 – all great stations. But I try to mix it up every day so they never have expectations of how they are to be tortured. Some days it’s Classic Rewind, Alt Nation, or Ozzy’s Boneyard. Some days it’s The Message, The Blend, or Watercolors. My thirteen year-old son, when that last one was playing says to me, “You were able to drink beer when that song came out.” This stumped me for a minute wondering why that was his first thought when listening to a song with such dark lyrics. But he was right. Barely. Then my mind trailed off into the land of Where Has Time Gone. I turned twenty-two in 1995. That song on the radio that couldn’t have been more than five or ten years old was actually twenty years old. Twenty. Yikes. Starting tomorrow, the front-seat passenger gets to choose the music. I’m hoping for a current Top 40 station.